Your choice of beef, salmon or tuna. Squid rings and tentacles in milk serum seasoned flour. Lightly fried until golden brown, mixed sweet red chili sauce, rice wine vinegar and roasted green Pimineta, diced peppers and parsley. Delicious creamy soup with Lobster and brandy, served with chopped lobster meat and parsley. Crunchy slices of toasted bread with garlic, seasoned with garlic butter and Romano cheese. Saffron infused pasta filled with veal osso buco and fresh mozzarella cheese. Served with sautéed spinach and white wine demi glace. Caramelized onions and stewed in a rich beef broth, flavoured with thyme, salt, freshly ground pepper, bay leaves and sherry. Brown Swiss cheese. Our own recipe served with carrots and celery julienne and side of potatoes chips. 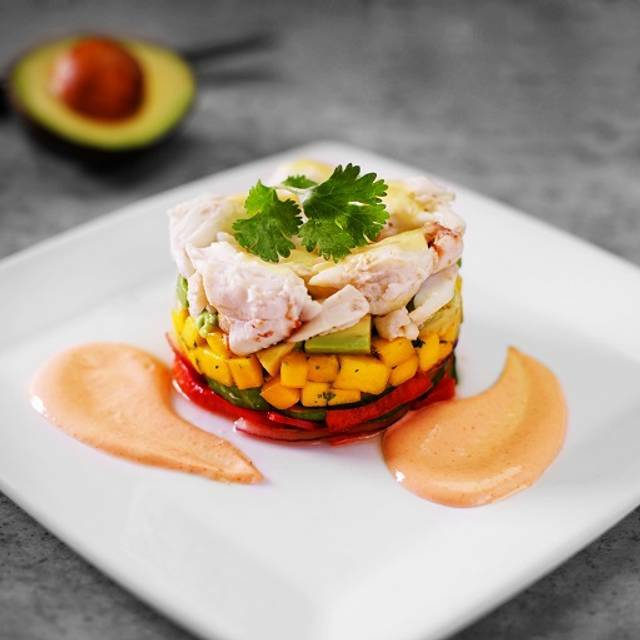 Ahi tuna, bell peppers, cucumbers and tossed in a spicy ponzi sauce, served on top of fresh greens. 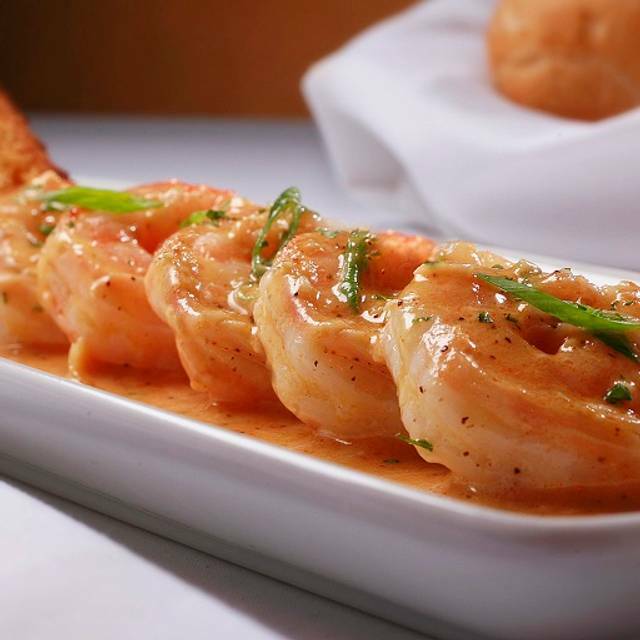 Plump gulf Shrimp dressed with your choice of our classic Creole remoulade sauce or our spicy New Orleans home-style cocktail sauce. With Crumbled Bleu Cheese and vinaigrette dressing. A Crispy Wedge of iceberg lettuce on field greens, topped with bacon, crumbled blue cheese and your choice of dressing. Variety of lettuce, red onion, cherry tomatoes, cheese croutons, dressing on your choice. Julienne Iceberg lettuce with mixed vegetables, green olives, bacon, egg, croutons, onion, crumbled bleu cheese and lemon-basil dressing. USDA Prime served sizzling on a 500° plate, every bite is as delicious as the first. Nothing better to share than this usda prime giant example of the usda, for two. 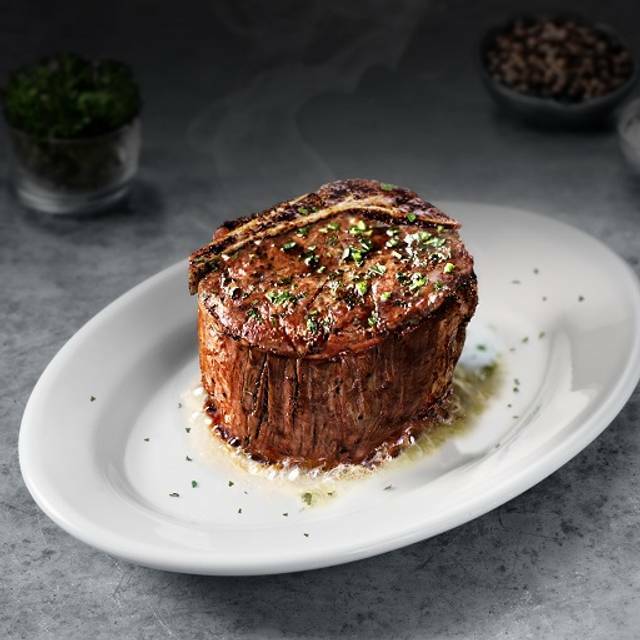 A full-flavored classic cut of Usda prime combining a tender filet and a New york strip. An outstanding example of USDA Prime at it's nest. Well marbled for peak flavor, deliciously juicy. Hand cut extra thick. Extremely tender, thanks to the natural marbling. Tender white milk-fed veal. Perfectly broiled to release all delicate flavour. With all the qualities of the famous ribeye we present this Bone-in version that adds even more flavour. Oven roasted double chicken breast stuffed with garlic herb cheese. 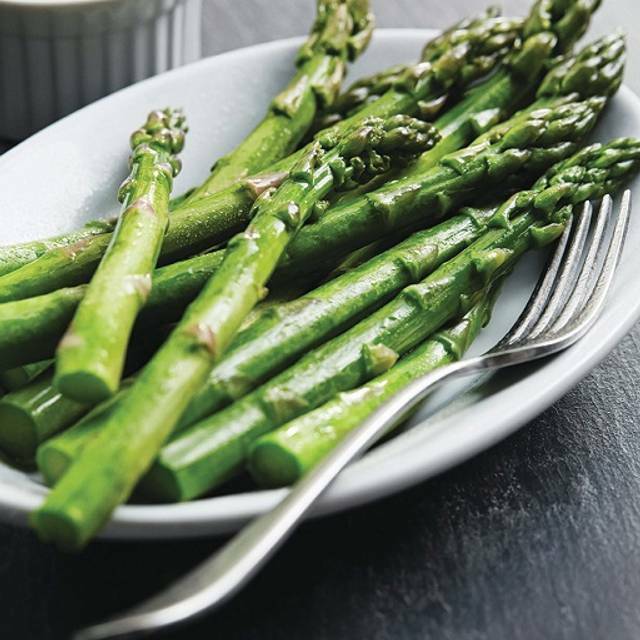 Tempt yourself and try one of our suculent recipes: garlic butter, garlic crust, lemon crust or simply grilled. Fresh lobster wonderfully sweet and succulent. Two 4-ounce medallions of our filet with large Gulf shrimp. Fresh hand cut salmon Filet available broiled or with Cajun spices. Fresh tuna pan-fried in hot spices with the famous New Orleans style. Large shrimp sautéed New Orleans style in reduced white wine, butter, garlic and spices. Tender pieces of filet and shrimp with onion, pepper, mushrooms and tomatoes. 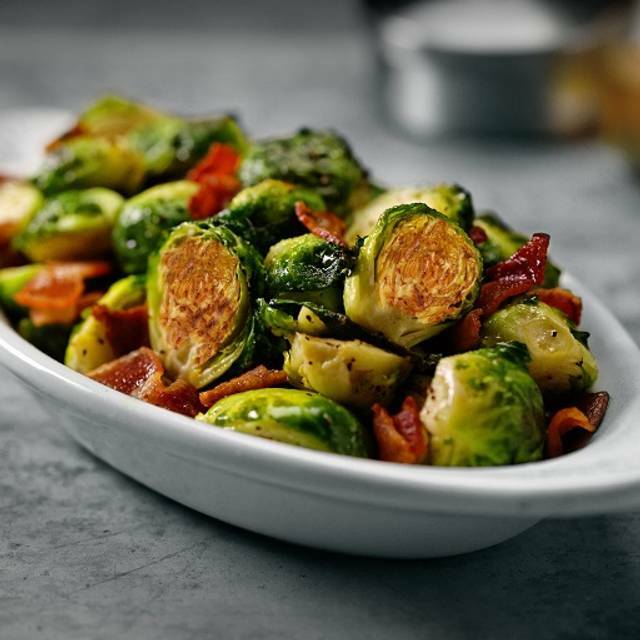 The perfect complements for your meal. 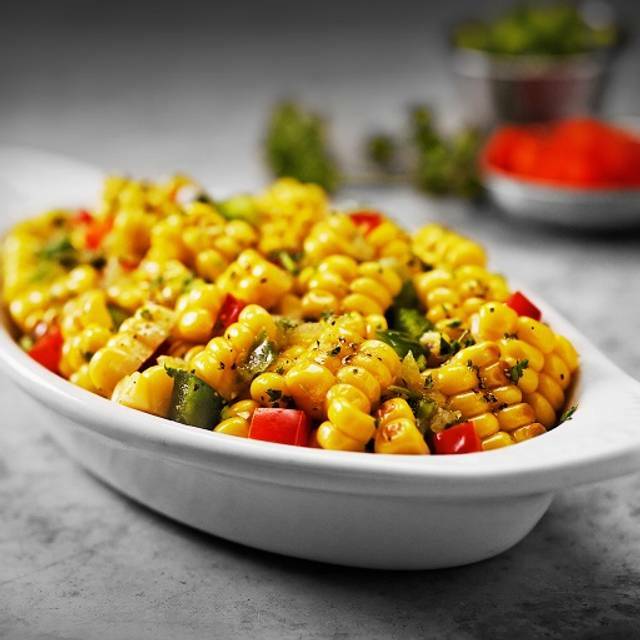 Seasoned with spices, touch of lemon and sprinkled with a little butter, chopped fresh parsley at the end. Delight yourself with our famous potatoes. With butter, sour cream, bacon and chives. 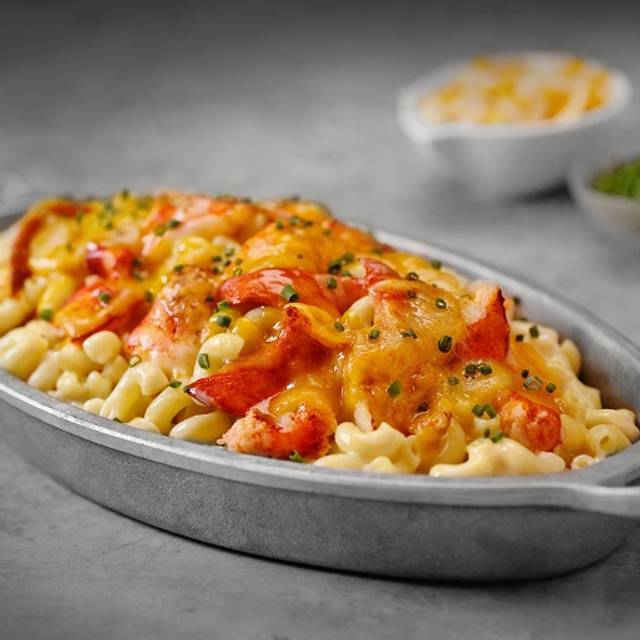 Served in a cream sauce, topped with melted sharp cheddar. Fresh vegetables prepared every day. Roasted with garlic and fresh herbs then sautéed in a veal demi-butter. Ripe tomatoes sliced ​​in half, with fine sugar and baked until golden, melted butter and chopped fresh parsley. Cooked in a white sauce (recipe from the house) and seasoned with salt and white pepper. 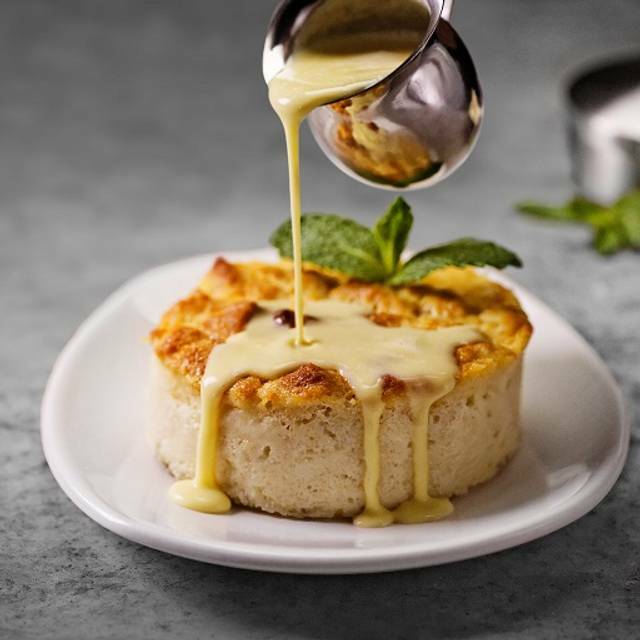 Mixed with a three cheeses cream sauce with salt and white pepper, baked with Swiss and Cheddar cheese. Pods Fresh Steamed Asparagus, Hollandaise Sauce accompanied. 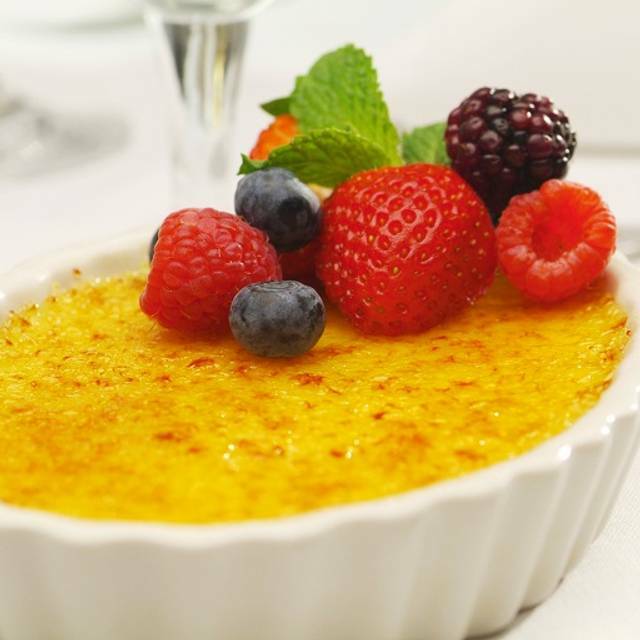 Our desserts are homemade by our expert pastry chef. Granny Smith apples Baked in a flaky pastry with streusel crust and topped with vanilla ice cream. Our rich Chocolate Cake Flour less with an espresso touch. Definitely a traditional New Orleans favorite. We have been coming to Cancun for over 30 years. We have been coming to Ruth's for the last 10 years and we always have a great meal. The service is always exceptional. We will definitely return next year when we come down for vacation. We have ben here several times before and Ruth Chris Steak House does not disappoint. It is expensive but the food and the service is top notch. Service was outstanding and food was too. Our favorite of all the Ruth’s Chrises we have been to. All the food was very very good... would have been nice if our sides came out with our steaks. Otherwise everything tasted very good and we were very happy. The excellent food is only exceeded by the unsurpassed service. Antonio was an amazing server!! We spend several months each year in Cancun and always have at least a couple dinners at Ruth’s Chris! Solid choice. Same quality you’d expect at any of their other establishments. No frills steakhouse. Delicious. Enough said. Great service. 5 stars all the way. Our anniversary. And we were made to feel extra special. Really great waiter. Steaks came when we weren’t done with our salads. Took our salads. Steak raw/rear. We ordered medium rare on filets. Took them to refire. Could have finished our salads. Nice chocolate dessert for Hubby’s birthday. It was my birthday an the FOOD was the worst Ruth Cris I’ve ever been to smh. Made a reservation same day for my bestfriends birthday. They accommodated us, the service was great and the food was great as well. Would def recommended. Very good food and service. Food for the kid with special requests arrived just as ordered. La comida es indiscutiblemente buena y el servicio excelente! Estuvimos cenando el 31 de diciembre, por lo que el ambiente era, quizá, bastante más festivo de lo habitual. La comida es excelente, las raciones son mucho más que generosas y la atención es muy cercana. Quizá la única área de mejora sería que el espacio se hace poco acogedor. Es un comedor muy amplio y casi diáfano. Creo que sería interesante darle algo de "carácter". El precio es bastante elevado, pero la verdad es que la calidad de los alimentos lo amerita. Ruth's Chris is a chain steakhouse so I've had multiple experiences at them. Our NYE plans fell through and I felt lucky to get us a table there 3 hours beforehand on NYE. I dropped off a bottle of wine to have it opened early to let it breathe. This was never done. We showed up and were seated half an hour late. I get it, it's NYE but a bit better planning on the restaurants part is in order. The food was good, but not quite up to the standards of other locations of the same chain. Especially the steak. If that was prime I'll eat my hat. It was Choice and was a tad over cooked. Not so much so that I complained. It may seem like I'm nitpicking but at this level you are paying for exacting standards and service. At the end I was charged for corkage which while legitimate seemed in poor taste considering I went through the effort to drop off my bottle hours early and they didn't get it opened. Like most modern American restaurants it's very open plan, which is great for the live Saxophone player who complimented the DJ music, but can be overwhelming if you want to have a quiet conversation. Now the good part. In general it was a fine experience if you like American style steak houses. Our wait staff was attentive, the timing on food delivery was good and I felt like the pricing was reasonable. It actually was a bit cheaper than it would have been in the US. Somewhere around 20% cheaper. Even though I speak Spanish everyone we interacted with spoke reasonable English, which for some adds to the experience by lowering communication barriers. Overall we had a nice evening there and would return. A great way to spend Christmas Eve. Excellent food & service. The steaks were wonderful, the service very attentive and the prices were fair. Amazing food and staff they are the best! Daniel was our server & was absolutely excellent! Second time at this Ruth’s & second time Daniel is serving us. All staff is very attentive. Food was delicious & perfectly prepared as usual! Service & food was excellent. This Ruth’s Chris is consistently a wonder dinning experience. We were there over 2 hours. Wonderful for a special occasion. Everyone speaks fluent english. The steak and lamb chops were amazing. The only issue was the restaurant was extremely cold, my wife and daughter would have taken a cardigan had they known. We 100% recommended and we will go back when in Cancun next, with some warmer clothes!